The climate smart Temperate Day Cream is a lightweight moisturizer designed for those who live in temperate climates where the temperature is mild, humidity is average, and man-made conditions, such as pollution, are not at peakthe climate that skin prefers. In this skin-loving climate, the uniquely formulated Temperate Day Cream hydrates, protects, and locks in moisture for maximum beauty, hydration, wellness, and glow. The Temperate Day Cream contains Climate Energized Beautifiers (TE-CEBs) include cutting-edge hydrators and seaweed extract, a soothing marine botanical to protect and maintain skin's natural balance when faced with mild irritation caused by the environment. 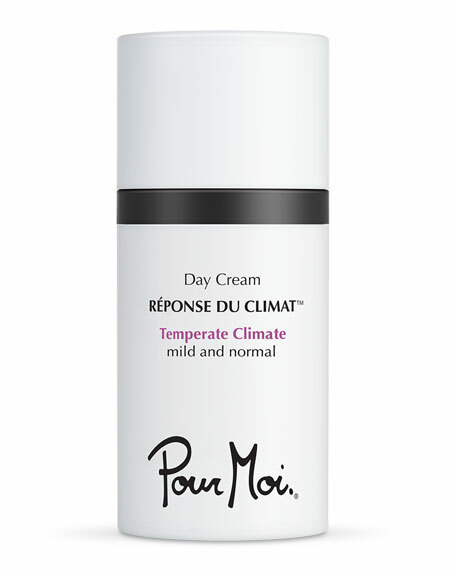 The Day Cream is the third step of Pour Moi's climate smart skincare ritual. Hydrates and promotes healthy lipid barrier functions for instant moisture and firmness in transitional seasons like spring, fall, and mild winters, so skin is healthier on the inside and happy on the outside. After the Serum has fully penetrated, apply one drop to the face and neck with your fingertips. Rotate the Temperate Day Cream into your skincare routine when in temperate climate. For in-store inquiries, use sku #2419037.